$8 Promotional Gift Card available on this product! This shirt fits about like we’d expect for “normal” US men’s sizing. We measured a selection of sizes and also tried these on our fit test mannequins. Huey is wearing a medium and Dewey is in the XL. These are the sizes they normally wear. The fit is looks good. I’d advise to choose the size you normally wear in men’s clothing. This shirt fairly close to the body with not much room left (a good fit for motorcycling), so if you are between sizes, I’d suggest choosing the larger. To make size selection easier, we’ve developed the chart below to help you choose a size based upon your chest and belly measurements. If you have a bit of a belly, just make sure that the vest you choose will be big enough for both your chest and belly. Note: if you plan to add a back protector to this jacket, then add 1” to the chest/belly measurements before choosing a size. 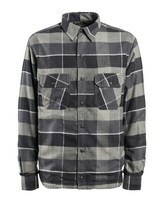 I’m looking at two Roland Sands flannel shirts today… the Gorman and the Stoddard. They both have similar features, so I’ll tell you about both in this review. These flannel shirts offer a 100% cotton flannel shell with a full Aramid lining and then a quilted nylon full liner. I didn’t tear one apart to actually see the Aramid, but the liner feels like it is stitched to the shirt’s inner nylon liner. I like the nylon inner liner because it is slick and you can easily slide the shirts on over your street clothes without having your sleeves wad up inside. I personally always look for that feature when I buy flannel shirts to be worn as over-shirts. The full Aramid lining will add some abrasion resistance that a normal cotton shirt wouldn’t have at all. And being fully lined, it is a step beyond most over shirts like this we sell since most are only lined with Aramid in the shoulders and elbows. Keep in mind that an overshirt like this won’t give nearly the protection of a full-on riding jacket, but the flannel is becoming a very popular choice for many riders that just don’t want to do the riding jacket thing. These shirts both have provisions for the addition of both back armor and elbow/shoulder armor. The armor is made by Forcefield and is nice stuff. The armor pieces themselves are a three ply arrangement which allows them to flex and mold to your body shape easily. Both shirt styles have the full zipper up front which positively keeps the shirt on your body in case of a fall. Shirts with only buttons are snaps won’t be secure. Roland Sands says: Looking for a classic flannel shirt that will actually provide protection when things get gnarly? The Gorman by RSD has you covered. With a fully Kevlar lined construction the Gorman provides the abrasion resistance you would not expect from a flannel shirt. Additional features include a shorty front zip with a snap down slap to keep the flannel closed when you’re getting on the gas. Black ops RSD trims, a quilted liner to block wind and provide some warmth and a riders fit. The Gorman can be fully armored so it’s great for layering with a vest or just wearing it as a jacket.